Keep your frozen and refrigerated items at the proper temperature with this Freezer/Refrigerator Thermometer from Taylor. The extra-large, 3-1/4-inch dial features a glass lens and red pointer, making this analog thermometer's accurate measurements easy to read. 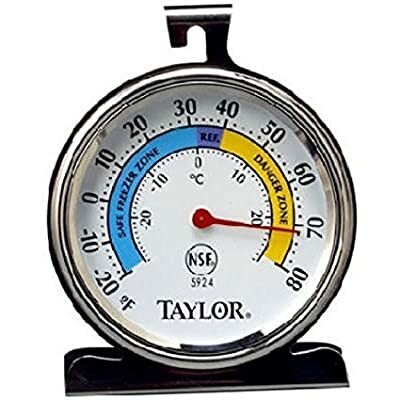 This freezer/refrigerator thermometer has a range of -20 to 80 ° F. Colorful blue and yellow graphics with safe temperature zone indicators ensure your food is kept at the proper temperature range at all times, while the durable stainless steel casing provides strength and corrosion resistance. This appliance thermometer's unique design has the ability to either hang from a shelf or stand on its own, making it the perfect addition to any home fridge or freezer.